How many times have witnessed a truly inefficient process and said something like “They really need to do a Six Sigma project on this.” Here’s one I think many can relate to. Jason Steffen is a Brinson Postdoctoral Fellow at the Fermilab Center for Particle Astrophysics. His research includes experimental searches for axion-like particles, strong and weak gravitational lensing, experimental tests of gravity, extrasolar planets, and some other odds and ends. He has a B.S. in physics and mathematics from Weber State University and his Ph.D. in physics from the University of Washington (Seattle). In a paper published in the Journal of Air Transport Management he describes the optimal method to board passengers onto an aircraft. Long lead times to board a plane is not only hugely frustrating for customers already in a snarky mood by the commute to the airport, the line-up to check their baggage (if they are foolish enough to make that mistake), the line-up and ritual disrobing at security, and then the wait at the gate, but industry analysis has shown that every minute a plane spends at the terminal costs $30. Assuming the average carrier runs 1,500 flights a day, saving as little as six minutes per flight adds up to $100 million a year. Steffen shifted his attention from the search for exotic new particles after becoming frustrated with the long waiting lines at departure gates. He used a technique called Monte Carlo analysis to simulate how passengers move around a gridded space on an aircraft. Modeling and common sense said filling a plane from front to back is the worst way to go because everyone’s waiting for the people in front of them to sit down. 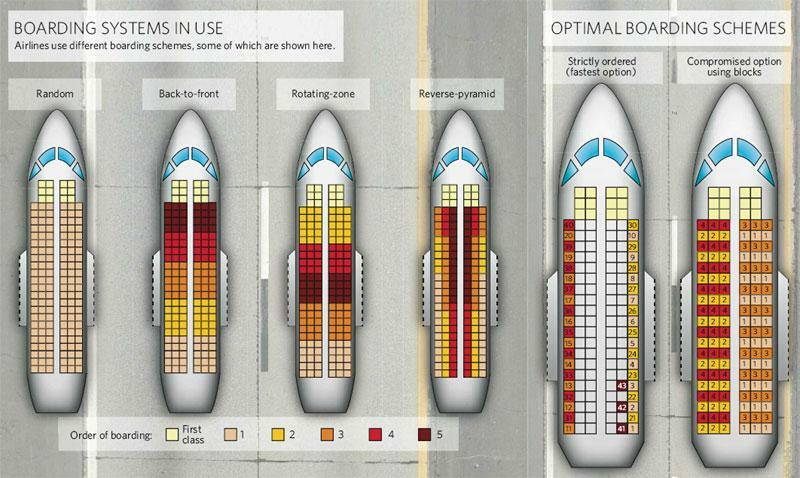 That’s why most airlines fill planes from back to front. But Steffen was surprised to find that such a method doesn’t save much time. It fills the plane in a hurry, but no one’s got room to stash their stuff. You spend 15 minutes standing in the aisle while the woman in 17A fumbles through her backpack for her headphones, the guy in 22D struggles to get his suitcase into the overhead bin and the kids in row 14 argue over the window seat. That’s why it takes 25 minutes or more to fill a plane. 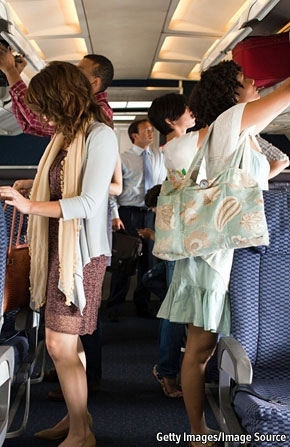 Give people enough room to get their bags stashed and you really speed things up. So how much room do people need? Steffen’s simulations found that boarding is most efficient when you give them two rows of space to stash their stuff. On a plane with 20 rows, that means having no more than 10 people boarding simultaneously (a 40-row plane can handle 20 people), filling every other row down one side of the plane — 1A, 3A, 5A and so on — then the other. Try to get any more than that aboard and things start slowing down quickly. That may be, but not everyone will want to hopscotch down the plane. People traveling together usually sit together and want to board together, and an airline’s not going to risk ticking off customers no matter how much time it might save. No problem, Steffen said. Fill the even-numbered rows first, alternating from the left side of the plane to the right. Repeat the process for the odd-numbered rows. Steve Lott of the International Air Transport Association isn’t so sure. The fastest way to fill a puddle-jumper with 19 seats may not work on a jumbo jet with room for 550, and even the best algorithms can’t simulate the behavior of several dozen hurried passengers struggling with suitcases, laptops, backpacks and kids. Steffen is ready to show the industry what he’s found, and eager to do some real-world testing. But no one in the industry has called.